For the second time this season, a Cavs-Warriors holiday game didn’t give much hope that any team but Golden State could win the NBA title this year. Playing in Ohio for their final scheduled meeting with the Cavs this season, the Warriors calmly took care of a Cleveland team that put up perhaps the best fight they could, winning 118-108. The Cavs’ start was promising, as Cleveland dropped 37 points in the first quarter and continued on to take a seven-point lead into halftime. Dwyane Wade was playing like it was 2012, finishing with 10 points, seven rebounds, and five assists and contributing to the most exciting play of the night with his steal and alley-oop to Jeff Green. Elsewhere, LeBron had 32 points on 12-of-18 shooting, and Kevin Love had a strong, efficient 17. But Cleveland could only hit 7-of-28 from three-point range, and even though Golden State wasn’t that much better at 12-for-32, the imperfect work from the field was enough to sink the Cavs. Sharpshooters Kyle Korver and J.R. Smith only went a combined one-of-four from deep, while Isaiah Thomas could only net 19 points on 21 total shots. 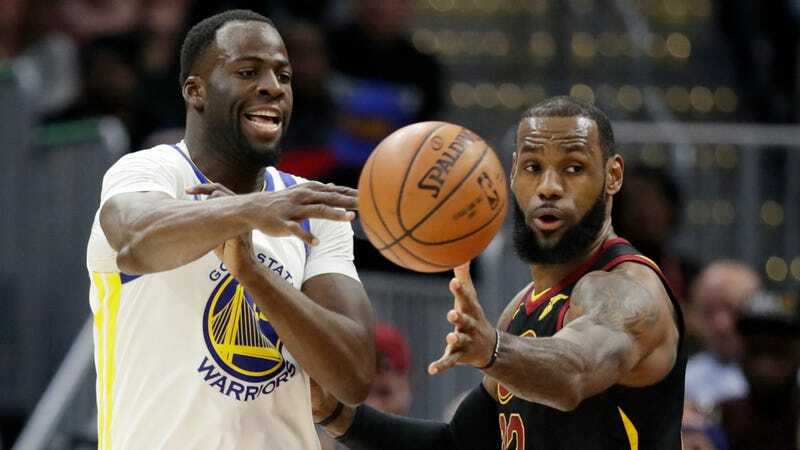 With Durant, Curry, and Thompson all at their best, and Draymond Green falling just one assist short of a triple-double, Golden State came back and outscored Cleveland by 17 in the second half. They reminded us all that, even though this Warrior squad is clearly less motivated in this regular season, an opposing team still usually has to be perfect to beat them. And against all odds, they’re still demoralizingly unselfish. In fairness, maybe the struggling Cavs simply aren’t Golden State’s closest competitors anymore. Within the past week, the Raptors kicked Cleveland’s asses and played the Dubs to just a two-point loss, while the Celtics hold the best record in the East and already beat Golden State this season. Still, at least so far, the only team that’s ever been able to stop the Steve Kerr-era Warriors is LeBron’s Cavs. For anyone waiting around to see Golden State get knocked off its pedestal, this game was another one to offer very little hope.